As one of my most popular colors to date, Green Holographic Metal Flake has a truly incredible effect under the light of the sun. It is truly the newest and hottest glitter on the market, and is incredibly brilliant. PPG has it’s own version of it called Prizmatique, and I believe HOK has one too, but mine do the same thing and costs about $20.00. Compare and save! Comes in 4 fl. Oz. jar and is a fine .004″ powdered flake. Easy to spray through all standard Paint Gun Tips. 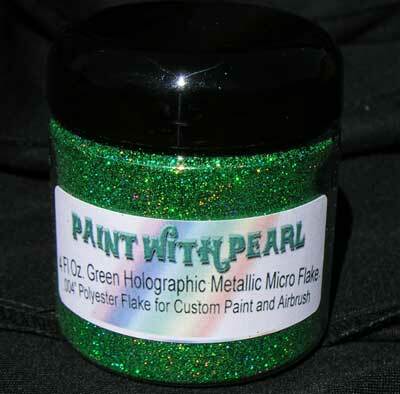 Green Holographic Metal Flake will not just add sparkle, but will add more colors than you can count. It creates a linear rainbow reflection like a prism.